Ruth’s childhood years were spent in industrial West Yorkshire, a palette of dirty red brick buildings and, in memory, more wet and cold than balmily sunny! She still feels these temperaments are built into her. Hard work, taking care of the pennies; finding creative ways of managing on a small income. Ruth’s mother always found a way and was indomitable. And a few miles away, they could find vast, open spaces on the Pennine Moors, a landscape that she remember as vividly appealing in the touch of its cool air and the call of Curlew and Lapwing. After 30 working years in London and a further 10 in Suffolk, inhabiting the landscapes of peoples’ minds as a psychotherapist, Ruth turned her focus back to the external world and began the slow process of letting its energy run in her veins again. She has, to her surprise, found the flat coastal landscape of Suffolk to be one which she can, despite its flat lines, connect with. The easterly edge; the sea which would take back the land; the quiet, undramatic ‘valleys’ which have barely an incline, may have contributed to developing her practice into an increasingly minimalist form. She suspects that her work evolves much as the work she did as a Group Analytic Psychotherapist over a number of decades, through following, responding, considering, waiting, and observing. 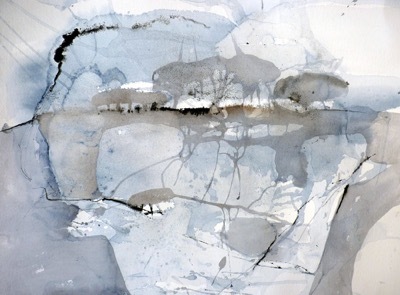 For four years Ruth has concentrated on watercolour, a medium which is often associated with ‘safe’, realistic painting. But the translucency of the medium pulled her in, and its very wateriness and unwillingness to be messed about with also challenged her. Ruth looks forward to the chance to return to a landscape that has elements even more dynamic than her childhood Pennines. She is excited at the possibility of seeing where her mark making will go when once again back in a beloved wild, even wilderness space.